This custom photo card wishes the people in your life “Happy Holidays” for the Christmas season. The design is flexible and the message can easily be changed to adapt this card design to any holiday occasion. A couple of photographs of your family, children or pets can be added to personalise your greeting card even more. Let us design your photo card for you to print. 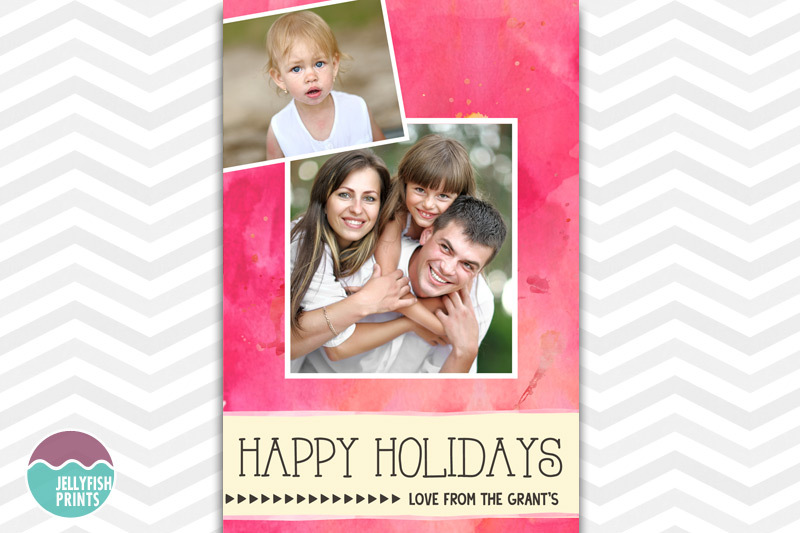 This Happy holidays cards design uses a lovely pink water colour painted texture for a backdrop to your photograph. You may feature up to 3 photos although we do recommend only 1 or 2. Each photo is bordered by a crisp white frame. Frame the whole family in one photo or split them between two photos. You might like to include a snap of any family pets you have in the smaller photo frame. If you photograph needs minor touch ups we are happy to edit the photo for free before it goes into the card. If you want to make any changes to the cards wording and colour schemes, this can be arranged by request. For the best results you should get these cards printed by a professional printer. The 4″x6″ cards cost between 10 and 25 cents to print from popular printers like k-mart or snapfish. Your printable season’s greeting cards design will be personalised with your information and photograph if applicable.